Baywater Farms grows our eggplant in gorgeous artisanal shades including white, traditional deep purple, and graffiti. Eggplant is typically available throughout the summer and early fall. Graffiti eggplant is known for its small teardrop shape and graffiti-like purple and white color. 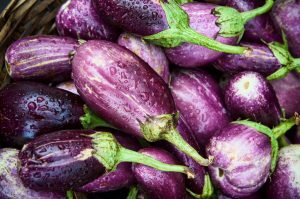 All of our eggplant colors are ideal for cooking and become melty, rich, and fruity when carefully prepared. Our eggplant is grown carefully using sustainable methods at our local family produce farm. We are committed to sowing seeds by hand, carefully cultivating our plants, and working our hardest to get a delicious product on the table at your restaurant. This delicious summer treat is pesticide free, so customers will feel good about sharing its unique flavor with their families. Our sustainably grown eggplant is available in bushel and half bushel boxes. Each eggplant is carefully harvested at the peak of flavor so that they have a mellow and mild flavor, instead of a sharp and bitter taste. Perfectly ripened eggplant is truly an art, and critical when it comes to ensuring a stellar final product. A ripe eggplant will remain the same size, have a beautiful glossy skin, and display soft, well-formed seeds when sliced. If an eggplant doesn’t yet have seeds, it is under ripe. If an eggplant has hard and dark seeds, it is over ripe. Store picked eggplant by rinsing them, patting them dry, and storing them in the refrigerator. Keep in mind that eggplant discolors rapidly once it is cut, so it’s important to work quickly. If you use a marinade with salt, lemon juice, or vinegar, you can help to prevent rapid discoloration. Baywater Farms is passionate about cultivating non-GMO eggplant with love and care in the same soil that our great-grandparents tilled. On our sixth-generation family farm, all of our non-GMO, heirloom, and sustainably grown produce is grown using high-quality seeds that yield gorgeous, colorful, and delicious results. We use ecologically-friendly farming methods and are dedicated to preserving the provenance of our seeds, re-introducing historical crops, and supplying everyone in the area with locally grown produce with a conscience. You can find our non-GMO, fresh eggplant in national grocery store chains, produce distribution companies, roadside farm stands, farm-to-table restaurants, CSAs, and farmers’ markets. To learn more about ordering our fresh local produce, click here. Our excellent sustainably grown, non-GMO produce speaks for itself, and we know your taste buds will love to listen!